In the past several years, rat populations have been exploding across the country, with The New Republic going so far as to call the situation a “Ratpocalypse” back in 2017. Even worse, experts say that these trends show no sign of slowing down, and the rat population is projected to rise even further in the coming years. 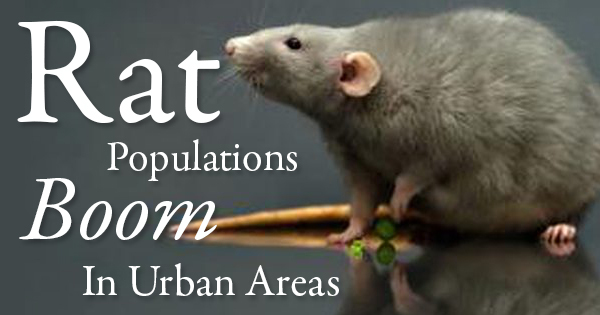 The rat baby-boom is going to be especially prominent in urban areas, with some of the most heavily affected cities being Chicago, New York City, Houston, Dallas, San Francisco, and Washington, D.C. Rats, despite their size, are one of the most destructive animals in the world today. They can wreak havoc on homes, restaurant kitchens, and agricultural harvests alike. In fact, without rodent removal and rodent control companies, rats, squirrels, and other rodents would destroy a significant portion of the world’s food supply, according to the National Pest Management Association. However, an increasing number of people in recent years have been keeping these rodents as pets. Sometimes, these “fancy rats” escape or reproduce too quickly for their human owners to handle, contributing to the massive rodent population spike in recent years. A rodent infestation can be bad news for your home or apartment. Rats’ small size and flexibility mean that they are able to sneak into tiny compartments, such as drawers, cabinets, pantries, and more. Of course, that also makes it easy for rats to sneak into your home in the first place. If you have an infestation, check any food items that may have had rats get to them. If you’re in doubt, it’s best to throw the food away rather than risk contamination. Rats can be vectors for a variety of diseases, and food can be contaminated if accessed by rats. As soon as you are aware of a rodent infestation in your apartment or home, call an animal and rodent removal company right away. By the time you’ve spotted a mice or rat, it has probably been living in your home for quite some time (along with the rest of its family). Rodents, especially rats, breed and reproduce remarkably quickly; waiting to call can allow them to multiply, making the problem worse, so catching an infestation early is critical. A professional rodent removal service will make sure to take care of the infestation as humanely as possible, relocating the animals whenever it is an option. Legacy Rodent Control can help you handle an infestation in your home or business. If you are dealing with a rodent infestation in the Dallas, Texas area, visit legacyrodentcontrol.com as soon as possible. Homeowners, landlords, and business owners around the Dallas area trust our animal removal professionals to quickly, and discretely, remove these pesky rodents from your space.